Xanterra Parks & Resorts, one of the Yellowstone’s large concession companies, is spending about $80 million to build brand new lodging facilities at Canyon Village, formerly the home of a large, sprawling modular cabin compound that was intended to be temporary when it was built more than 50 years ago. Nearly all of the old cabins are gone now-torn down, recycled, repurposed, or deliberately burned down for firefighter training, Rick Hoeninghausen, Xanterra’s director of sales and marketing, said recently. A few still stand, filling in as construction housing while the remaining two of five new lodges are constructed this summer. Some cabins remain for visitors to use: the newer, more modern Western cabins. The new lodges are modular, too, brought in on large semi-trailers in pieces that each make up two hotel rooms. The five lodge units will contain a total of 409 rooms. The lodges are located in the same area as the old cabins, but with a smaller overall footprint. The modular units are built by Guerdon Enterprises, in Boise, Idaho, in two-room units. The units are trucked to Canyon and stacked. Construction workers then do the interior work on-site. One big advantage to the modular units is that construction didn’t have to be done during the winter months, Hoeninghausen said. The roads to Canyon are not plowed for car travel during the winter, which saved tremendously on hauling equipment over the snow and housing employees at a remote, snowbound location. Canyon Village sits at 7,980 feet in elevation and gets some of the heaviest snowfall of any developed area in the park. The modular design is part of Xanterra’s commitment to build sustainably and to secure LEED status when the project is fully completed, Dylan Hoffman, director of sustainability said. LEED stands for “Leadership in Energy and Environmental Design” and a LEED rating is based on a point system, Hoffman said. Points can be earned, for example, by installing LED lights and low-flow water faucets, along with other construction techniques. Hoffman said the company is working for a LEED silver rating, but striving for gold. The final rating will be determined by the U.S. Green Building Council, which oversees LEED ratings. 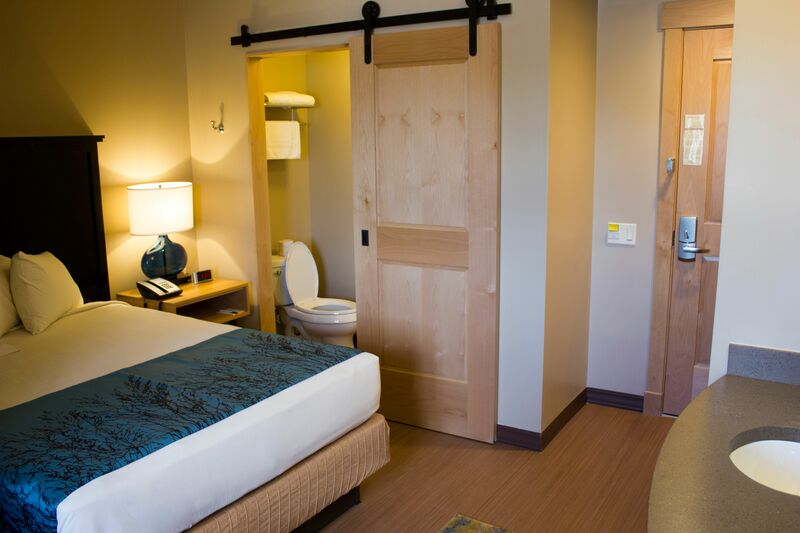 In addition to the modular construction, the room interiors contain sustainable elements including wood paneling and trim harvested from beetle-killed pine. The damaged pine has a pleasing blue cast to it. The rooms contain design elements that hearken back to the “old” Canyon Village look, which dates to the Mission 66 style. Mission 66 was a plan implemented by the National Park Service in the late 1950s and early 1960s to invest in the national parks in time for the 50th anniversary of the NPS. “Mission 66” is recognized for its mid-century “Mad Men”-like style, Hoeninghausen said. And in keeping with the sustainability theme, the countertops in the bathrooms are made by a Bozeman, Montana company called GeoMatrix, Inc. GeoMatrix makes countertops from a combination of fly ash and recycled glass. Fly ash is a by-product of coal combustion, GeoMatrix owner Jon Cross said. The finished product is a hard, attractive concrete-like surface that prices out about like granite countertops, Cross said. Most of the recycled glass came from Yellowstone and the city of Livingston, Montana, which has maintained a glass pulverizer for the past several years. 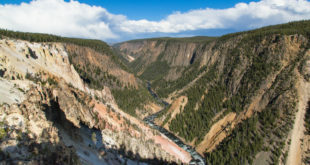 Cross said his company also installed some fly ash concrete in Gardiner around the Roosevelt Arch as part of the Gardiner Gateway Project, a $22 million infrastructure reinvestment project to improve access to Yellowstone and the town of Gardiner’s infrastructure. The project is meant to be mostly complete in time for the National Park Service centennial events slated to take place around the iconic arch on August 25. Hoffman said using locally sourced materials from within a 500-mile radius helps contribute to the LEED points. There are sustainable aspects that many guests will never notice, Hoffman said, like composting in the nearby dining areas, propane heat and low-emission paints and carpeting. “This doesn’t smell like a new building,” Hoffmann noted during a tour of one of the new lodge buildings last fall. The buildings will not have air-conditioning, Hoeninghausen said. For a relatively short season at a cool, high-elevation location, air-conditioning was deemed unnecessary, but the rooms will be equipped with small fans. Xanterra, in conjunction with the NPS, also tried to keep room rates relatively affordable and in line with surrounding communities. Hoeninghausen said NPS officials originally campaigned to include some rooms without private bath, but the company said most of its guests weren’t interested in using shared facilities. A rate for a Standard room is $140, with additional room types such as a Western cabin, superior room with patio, a premier room, and a suite, ranging up to $499 per night. Next year, Hoeninghausen said, Xanterra will revamp the food service at Canyon Village. The sit-down dining room will remain, but the cafeteria will be converted to a more contemporary “fast casual” style. This year, the old registration building will remain, but when the five lodges are all complete, one of the buildings will house a new check-in facility. The existing registration will be repurposed, but its possible use is still being considered. Canyon Village opens for the season June 3 and will be open until Sept. 25. Xanterra signed a 20-year contract with the NPS in December, 2013, and will have spent $150 million on various projects in the park to date, Hoeninghausen said. Photos courtesy of Yellowstone National Park Lodges. This article first appeared in the weekly Yellowstone Insider newsletter. Are you a subscriber? It’s full of Yellowstone information and travel tips. Best of all, it’s free! Go to our newsletter signup page to subscribe!